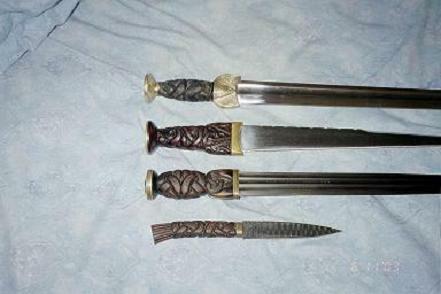 I know myArmoury has a few collectors and admirers of dirks, and since the picture hosting for one thread (Mac's one called a dirk for every day of the week, something like that) has expired or been removed i'd love to see some more pictures of either historical, reproductions be it custom or production (semi-custom). Also pictures of Sgian Dubh you guys have and where you got them, I've want to own a good quality Sgian with a carnigorn (smokey quartz) one day. Also a little more on the history, as in the carrying laws regarding dirks historically (while the british had full lordship), how were they most commonly used? blade facing the top of the hand on reversed with a targe? or were there really no styles of use as a weapon. With the cut down swords made into dirks was this really probable or like the myArmoury artical would they have been a utilisation of a broken blade made of a good steel? Frankly the dirk intreages me, its such a powerful icon of scotland and i personally would rather go against someone versed with a sword then someone highly versed in using a dirk. The picture I have attached are three dirks armor class currently have, I picked the one to the right and one of the others is sold...But i'm very happy with the service from Armor class, just await to see there quality. 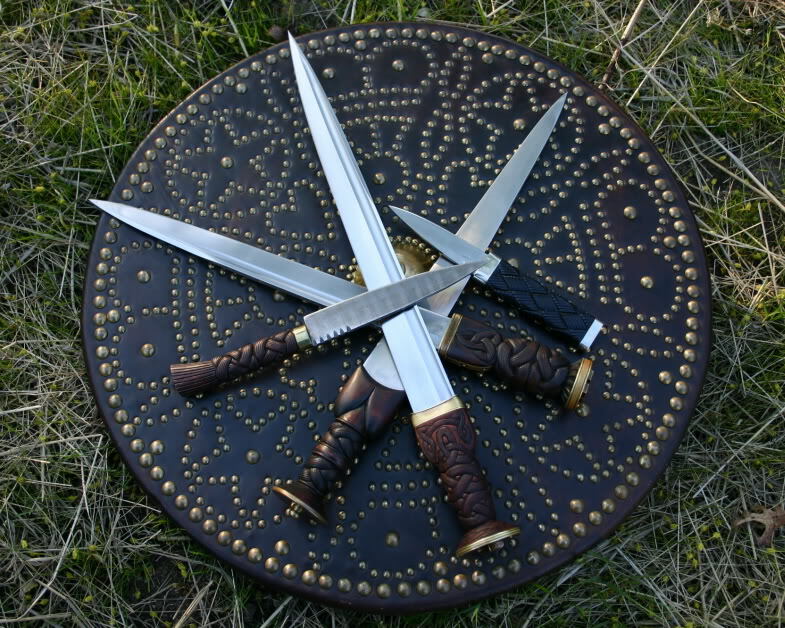 The Scottish Dirk spotlight has some info on using a dirk with a targe. According to my research for the dirk spotlight, dirks were held in the point-down ice-pick grip when used with a targe. There is debate as to whether the dirk was used as an offensive/defensive weapon when gripped with the targe or whether they were just held there to be easily accessible if your sword broke or was lost. 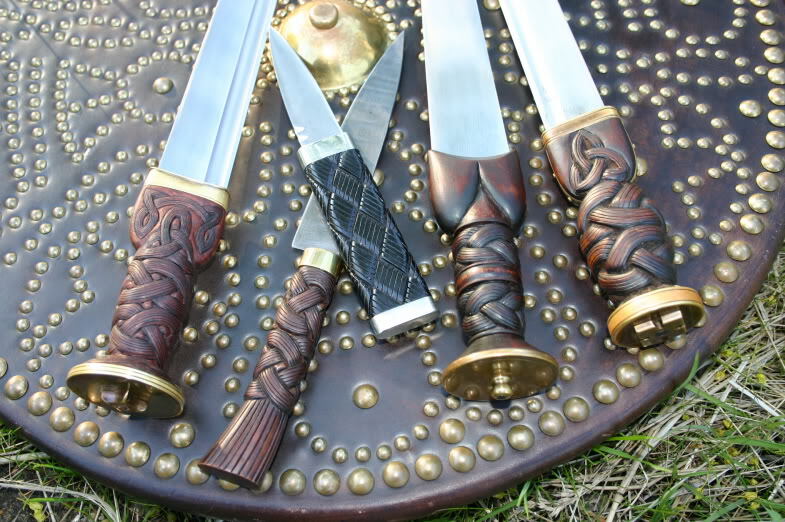 Swords were certainly cut down into dirk blades when broken or worn, but some useable ones may have been cut down when swords were outlawed by various British prohibition acts. A couple of ways of gripping the dirk while keeping control of the targe ! The only real issue I see with this combined method of use is that you could easily sink the dirk into your own leg, or worse, in the heat of battle ! But I suppose a well trained Hielander would be well aware and avoid such mishaps ! Chad thanks for showing me something i didnt know myArmoury had! I knew of the picture archive but didnt notice the search function...this forum is a treasure trove of goodies sword/edged weapon related! The use of a dirk is quite interesting considering the length of the blades on some dirks, the concentration level needed to use a basket hilt in one hand, deflect blows with the targe if needed and control where the dirks point is going definately shows the scottish wernt just flailing about like a "beserker". A more refined method of fighting probably learnt on the battle field and in the villages rather then in elite schools like upper class warriors of england and such would have had. 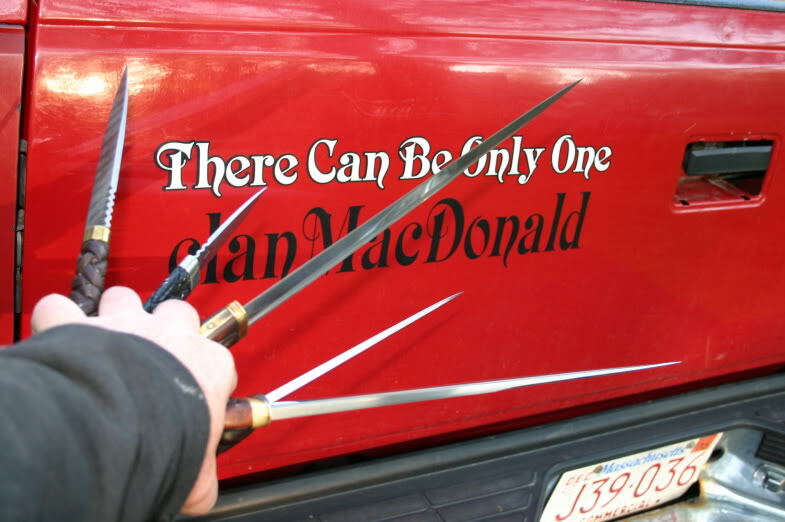 I've always been into scottish weapons and warfare and Mac your picture REALLY helps...Thats also a very impressive targe, who made that one for you? Armour class targes seem to be really good aesthetically but cant tell much else about them. Robert, I believe those Armour Class targes are made by Lindsay (the Targemaker: www.targemaker.co.uk ). Mac, What about having the targe strapped further onto the arm and having the durk pointing forward??? Mac bought it directly from Joe Lindsay of the Targemaker, before Armour Class added them to their website. They look really good. The problem with just looping the straps around the arm like Mac's second picture is that the targe could rotate around the arm if struck. Chad thanks for showing me something i didnt know myArmoury had! I knew of the picture archive but didnt notice the search function...this forum is a treasure trove of goodies sword/edged weapon related! The use of a dirk is quite interesting considering the length of the blades on some dirks, the concentration level needed to use a basket hilt in one hand, deflect blows with the targe if needed and control where the dirks point is going definately shows the scottish wernt just flailing about like a "beserker". 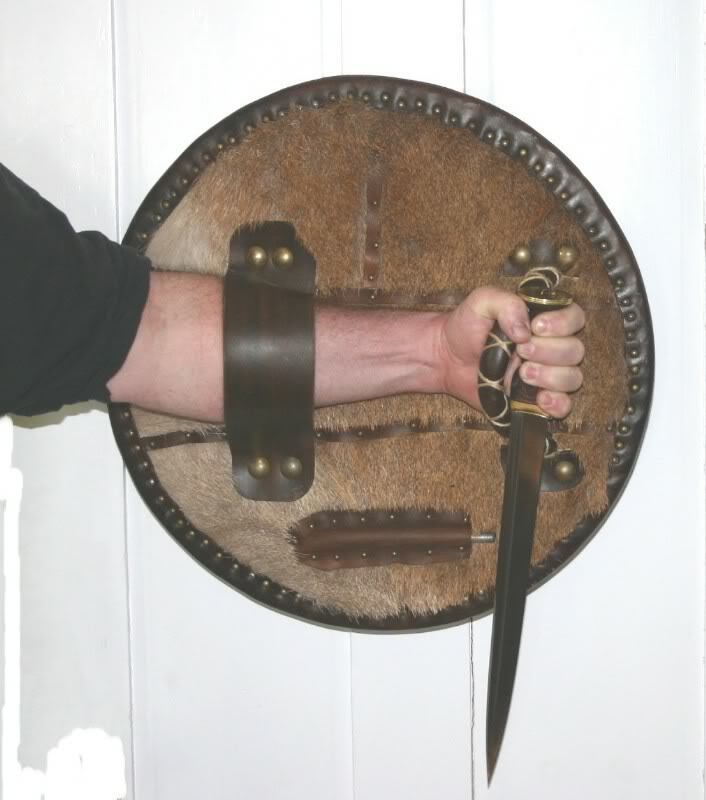 Many have speculated that a dirk held in this fashion [with the targe] could be used for backhanded slashes when an opponent closes in. Rolland considers it "highly unlikely" that the dirk and targe were used that way, since the weight of the targe would slow the left arm in a strike. 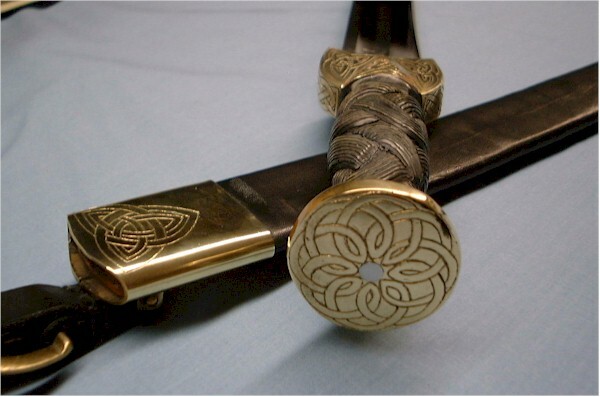 He concludes that it is much more likely that some highlanders used this configuration to simply keep the dirk close at hand in the press of battle: "should he [the highland soldier] have lost or have had to discard his sword, he would be at a momentary disadvantage while drawing his dirk, this normally requiring both hands." 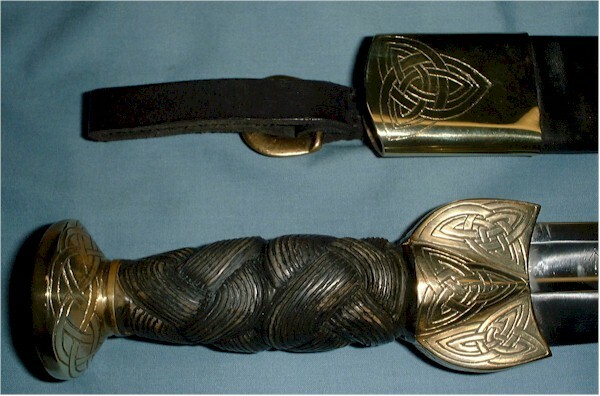 Another more remote possibility is that the use of the dirk in this way allowed the highlander to parry more effectively, "so as to lock the opponent's weapon between the dirk blade and the edge of the target [targe], thus unbalancing the adversary and exposing him to a swift counterattack." I haven't charged into ranks of redcoats myself, but I'm not sure the dirk was typically used offensively when used together with the targe. 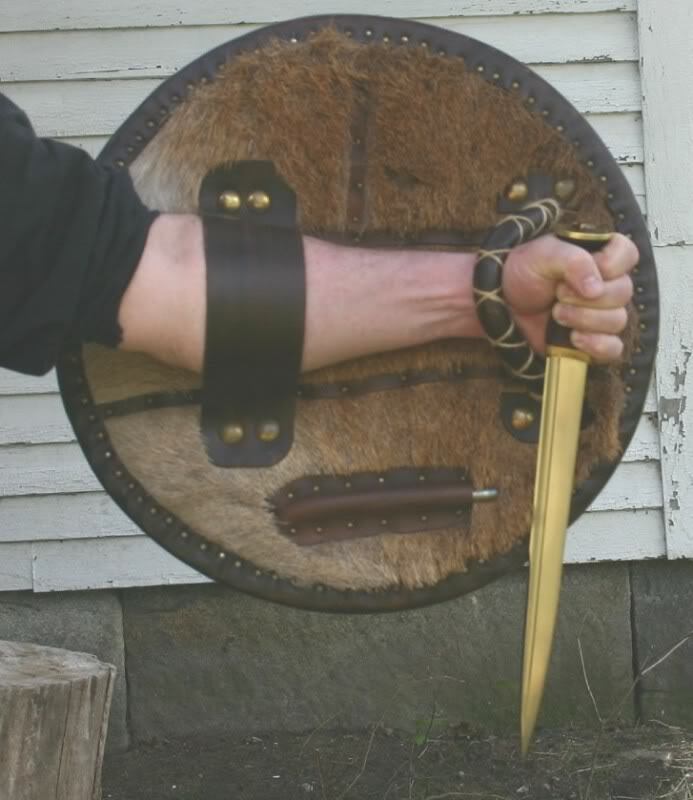 The weight of the targe, the length of the dirk's blade, and the difficulty in dealing with straps would all contribute to making it hard to effectively use the blade of the dirk without getting yourself killed (by opening yourself to attack). Very nice! Who made the top two dirks? Any close ups of the hilts? >since the weight of the targe would slow the left arm in a strike. >The weight of the targe, the length of the dirk's blade, and the difficulty in dealing with straps would all contribute to >making it hard to effectively use the blade of the dirk without getting yourself killed (by opening yourself to attack). I can't recall where the images came from, so it may likely have been some Victorian nonsense, but what we'd attempted after seeing some of the depictions was holding it just like in the second folder, only perhaps with the blade slightly less perpendicular to the arm, a little more slope towards the elbow. The technique involves a press forward and up with the targe, and then plunging down. The dirk's point sticking out about four inches beyond the rim of the targe makes this quite feasible, and with the targe moving up towards the opponents eyes, conceals your intent until it's too late. It also doesn't rely on speed so much as placement. Think a left jab/uppercut motion where you pendulum the Targe up and in front, at the apex of your swing, tilt the bottom slightly and plunge. If you're using this to counter a sword cut, it's a quite rapid and efficient motion. I'm not David, but I sold him the top dirk. It's by Michael Tinker Pierce. Here are more pics. I'm not David, but I sold him the top dirk. It's by Michael Tinker Pierce. Yes, and thanks again for the better pics (I'm a lousy photographer)! The second one down is also a Tinker, purchased from Scottish Sword and Shield some years back. 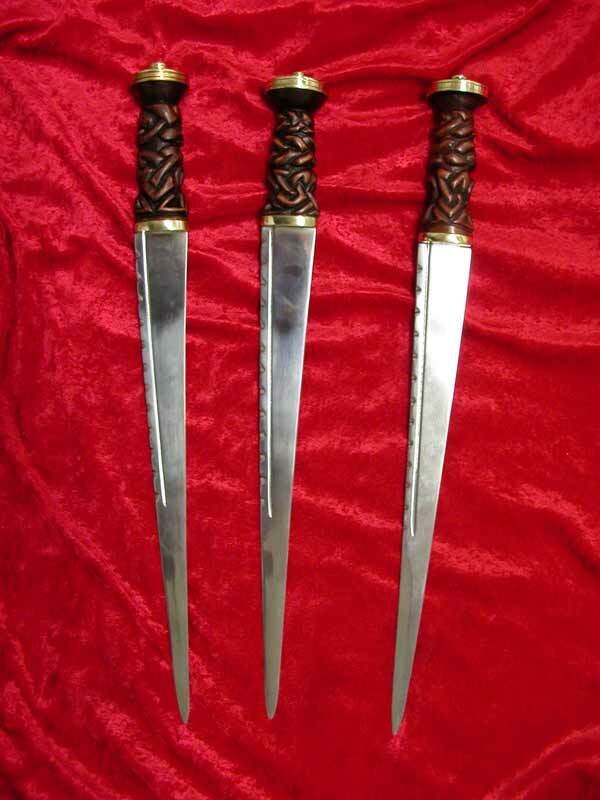 And yes, the next two are Vince Evans, but there's a bit of a story behind the dirk -- it is actually made from a broken sword blade, just like many of the originals! In fact it was the original blade he made for my S-hilt broadsword, but which turned out unsatisfactory so he recycled it. A few shots of my Vince Evans pieces ! Seriously, every time I see that briar-wood dirk of yours, I think "Now THAT is what a dirk should look like!" Great collection, Mac -- thanks for sharing the photos with us. Below are my Vince Evans Kelvingrove dirk, and the one Richard Mize made for me this past winter. Does vince have a website he sells from? i did a search and couldnt find anything...I'd really love a Vince Evans piece in my collection eventually!! !